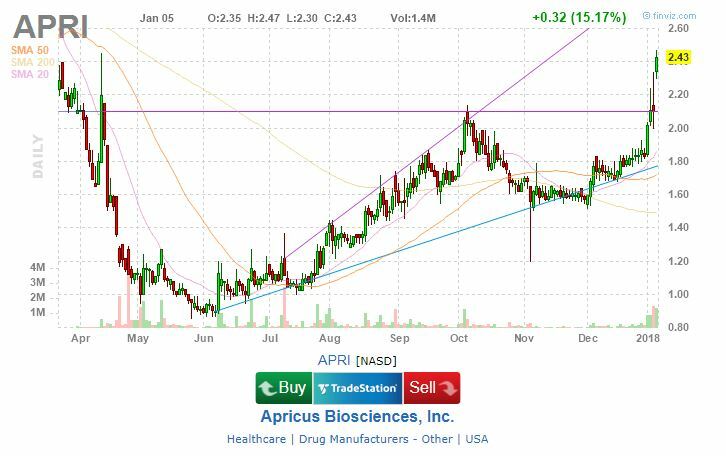 I like the setup on $APRI . Had good news on 1/18/17 and it&apos;s bull flagging on the daily and weekly charts. [TimAlerts] In the webinar by Mark Crook that Tim posted on youtube Mark talks about volume and high volume relative to the average daily volume for a stock and also a high average volume over 1 million. Does anybody have examples besides the ones in the webinar? I was thinking $APRI would be a good example from last Wednesday but I'm not sure if that has high enough avg daily volume. [TimAlerts] Have a position in $APRI - been watch it a while. I'm trying to gravitate toward day trading but so far not too much. [TimAlerts] $APRI no volume at all lol.